We've posted a few times in the past about staying healthy out on the road. Most recently, we offered up tips to stay healthy this flu season. During CDL training at trucking school, we make it clear to our students that being behind the wheel for long periods of time can certainly make it difficult to stay in good physical shape, but there are definitely people out there doing it. It's all about your mindset and making it a point to get in some excercise as often as possible. Today, I ran across an article on TruckNews.com about 4 truck drivers that find time to train hard for marathons, even though they are long-haul truck drivers. With the youngest of the 4 truckers being nearly 40 years old, they have certainly not let their age get in the way of training either. 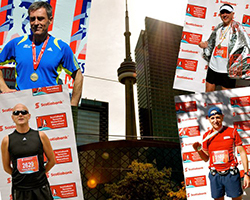 These guys are serious about their running - one of the truckers finished 89th out of a roster of more than 2,700 runners at the Scotiabank Toronto Waterfront Marathon on Sept. 26! "I started running two years ago when I noticed that my pants were getting too tight, and I decided that I had to do something about it," said Rozanski, a driver with Verspeteen Cartage. "Since then, I've burn about 150,000 (calories), according to my watch." Working a trucking job where you are out on the road traveling thousands of miles a week and having a family that you want to spend time with can make finding a chance to get in a run a challenge. "It's not just a hobby in my case, it is a passion," said Wojewodka. "I love what I am doing, and I am doing it because I know I can, and everybody else can do it too. I know I can do better and compete with serious runners who have more time to prepare themselves. That is what drives me, and that is fuel to my brain. In our case, with our families - wives, kids and a house that needs to be taken care of - it is really difficult to do what we are doing. We might not be seen as typical truck drivers, but we are. We spend so much time on the road, and in between our regular training we put in sometimes over 3,000 miles each week. It makes it even more exciting for us to challenge ourselves, knowing that you have to do what you have to do to provide your family with what they need, and on top of it do what you love to do, which is running in our case." It's great to read about this group of truckers and how they are inspiring others to stay fit out on the road. Check out the full article about these 4 truck drivers and how they each view training for marathons.